Odissea is the number one water sports company in Sal, Cape Verde for all the fun and excitement, offering Jet skiing, Para Sailing, Sailing, Spear fishing, Big Game fishing and much more. 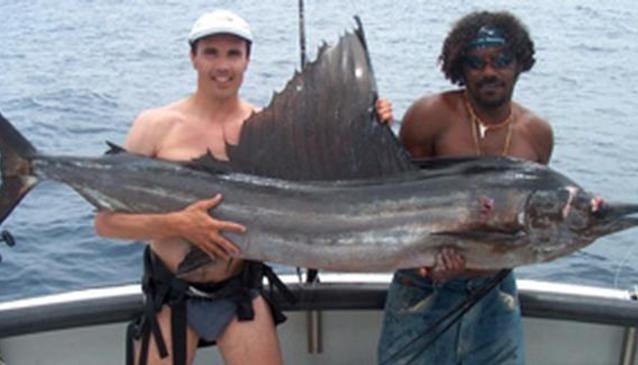 Cape Verde waters are rich in marine life and are a fantastic location for Sport Fishing, so why not join our experienced and qualified staff, who will take you on an unforgettable fishing experience. With a fully equipped 10 meter boat, Sal Sport Fishing provides full and half day trips catering for all experience levels. Experience the thrill of Jet Ski bikes and take one of our excursions around Santa Maria, great fun for all the family. Our Yamaha VX 4 Stroke jet ski is ideal for beginners and our fully trained staff will provide all the safety equipment and training to maximize your enjoyment. A great fun adventure for the whole family, hang on if you can while the speed boast flings you around the bay of Santa Maria. Life jackets are provided so have fun and let yourself go! A combination of snorkeling and free diving ,learn how to spear around the abundant waters of Santa Maria with our amazing spear fishing experience, full training and equipment provided.